There were also no major hiccups in the economy. In fact, the stock market is in the middle of the second-longest bull market since the end of World War II, trailing only the boom from 1987 to 1990. 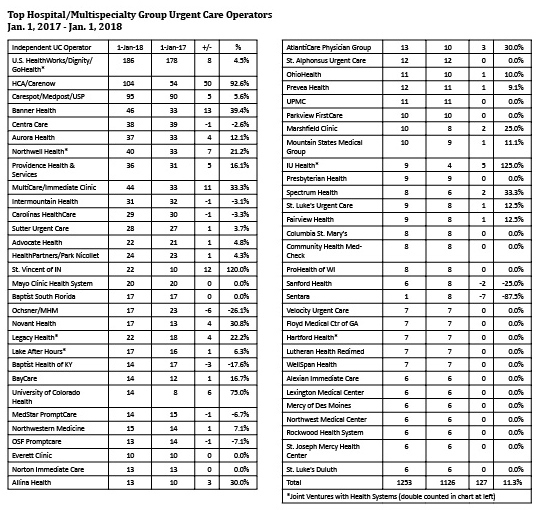 There was the typical deal flow among urgent care operators. There was the final completion of the Walgreens/Rite Aid transaction. And although you could argue there could be new upheaval in the health insurance markets with the repeal of Obamacare’s individual mandate, we’ve almost become immune to these kinds of developments. Even in the broader ambulatory care market, we see private equity investments underpinning not just stability but innovation and stable growth. In this article we will summarize the highlights of 2017 in urgent care and retail clinics. We will also provide some commentary on telehealth and lab stations. And we will provide some further insight into the CVS Health-Aetna merger. But the bottom line is that there are a lot of new developments at play right now, so 2017 may have been the calm before the storm. Growth and profitability were not a universal phenomena in the urgent care industry in 2017. If you look at just those we show in the table below, clinic growth came in at just over 11 percent, which we believe is reflective of the entire industry. The growth standouts were MedExpress, CityMD, GoHealth, Fast Pace, Premier, Urgent Team, MDNow and CRH. One of the past growth standouts became a victim of its own momentum: FastMed. That company went through a major reorganization in 2017, closing clinics, hiring a new CEO and restructuring its funding. Web Golinkin, formerly CEO of Rite Aid’s RediClinic subsidiary, is now CEO at FastMed. NextCare was another surprise for what didn’t happen. The company did some pruning in the fourth quarter and had a small net contraction for the year. But more importantly, another year went by without a change in ownership, which many have been expecting over the past two years. One additional note in the urgent care market involves MedExpress and Walgreens. MedExpress has opened full-service urgent care centers in Walgreens stores in several states. The centers are roughly 2,500 square feet, have their own entrance, full signage and inside access between the clinic and drug store. Could this be the retail clinic model of the future. Many believe it benefits both parties to the extent that we could see major expansion under this model. For the retailer, the Amazon effect means they don’t need as much floor space and welcome any new foot traffic brought about by their partner tenant. For the urgent care operator, it means prime retail visibility in high-traffic areas and significantly lower build-out costs. On the hospital side of the urgent care market, we see continued expansion, although not as aggressively as we see on the private side. Urgent care is clearly viewed as a way to get more people into the funnel under a population health model. But there is a lot of competition and doctors, nurse practitioners and physician assistants are becoming harder to recruit and retain. The retail clinic market continues to show signs of weakness. Although the number of hospital and non-retailer operators is growing slightly, we see a pull-back from the major retailers. In the case of CVS Health, 2017 represented a major shift. Instead of the double-digit growth in past years, we saw some growth early in the year and contraction later in the year. This slow-down began after CVS Health acquired Target Clinic sites as part of its deal to convert all Target Pharmacies to CVS Pharmacies. Walgreens has continued its program of converting its former Take Care clinic sites to hospital-run clinics, where Walgreens is no longer the operator of the clinics and employer of the providers. That program showed continued success in terms of hospitals’ willingness to enter the retail clinic business. 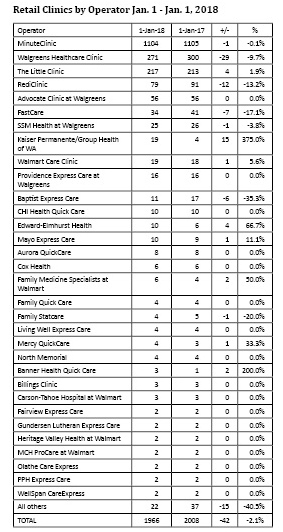 Among the new hospital operators now inside Walgreens is Aurora in Milwaukee, who moved out of Walmart stores in Wisconsin in favor of Walgreens. 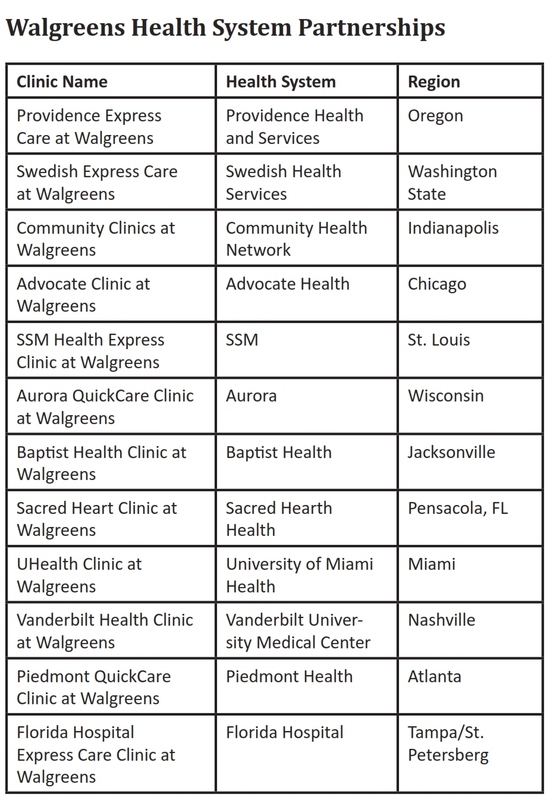 Other hospitals moving into Walgreens included Vanderbilt University Medical Center in Nashville, Piedmont in Atlanta, Florida Hospital in Tampa, University of Miami Health System in Miami, Sacred Heart in Pensacola and Community Health Network in Indianapolis. Also in 2017 we saw the completion of Walgreens acquisition of 1,932 Rite Aid stores, leaving Rite Aid with a balance of 2,600 stores. As part of this transaction, Rite Aid closed its RediClinics in the Baltimore/Washington DC area. Walmart continues to have two retail clinic models. The Clinic at Walmart, which is the model where Walmart leases space to hospitals and medical groups, continued to contract. That model dropped by 13 clinics in 2017. Walmart Care Clinics, the second model that Walmart operates itself, has remained at 19 clinics in three states for two years now. The company told Bloomberg News recently that it plans to add more clinics under that model soon. But The Little Clinic, a Kroger subsidiary, continued with modest growth in 2017. One major advantage for The Little Clinic is it pursued employer services very early on. Compared to its retail pharmacy competitors, Kroger stores have huge parking lots, which can accommodate 18-wheel rigs and their drivers who need DOT physicals and drug screens. Another advantage for The Little Clinic is it can more effectively sell weight loss counseling services given their stores are where people buy their food. Although The Little Clinic has been growing from a smaller base, it is creeping toward the number that Walgreens directly operates as that company gets out of the direct operation of retail clinics. One final note about retail clinics is the growth of telehealth and lab stations inside grocery stores. Walgreens announced a deal with LabCorp to develop and operate patient service centers within select Walgreens stores. NewYork-Presbyterian and Walgreens also announced they are collaborating on telemedicine services through self-service kiosks at Duane Reade drugstores in New York City. Meanwhile Albertsons, which owns not only the Albertsons brand but also Safeway, Jewel Osco, Star, Shaws and many others, now has a total of 270 stores either with lab stations or telehealth stations. That’s in addition to the 32 stores with full-service retail clinics with prescribing nurse practioners or physician assistants. These models are not new but they are on a new wave of proliferation. The telehealth model in particular has tremendous potential, but that potential will not be uniform from one specialty to another. In the acute episodic illness space, we remain not only cautious but somewhat pessimistic on lab stations and telehealth kiosks. The available market for these services is not unlimited. The competition for those visits by urgent care, retail clinics, worksite clinics, physician offices and telehealth has pretty much eliminated any remaining room for growth by new entrants. It will be telling what we have to say about this space a year from now. Perhaps the most significant development in 2017 was the announcement that CVS Health and Aetna intend to merge. There is some debate on whether this has anything to do with on-demand medicine, and there is merit in arguing it doesn’t. One line of thought, highlighted by most articles on the subject, is the prospect that Aetna and CVS intend to leverage the MinuteClinic platform to deliver lower-cost healthcare. Two aspects of the MinuteClinic footprint would indicate that this has nothing to do with the merger. First, CVS has more than 8,000 stores. Only 1,104 of them have a MinuteClinic and those are concentrated in the largest 100 metro areas in the United States. It will take a much greater footprint of MinuteClinic locations and a much wider scope of services to pull off a full-court press on lowering costs using this strategy. Second, there was no evidence of MinuteClinic expansion in 2017 to go along with this merger. What is more likely is that CVS Health is aiming to compete directly with UnitedHealth Group in terms of the integration of pharmacy and medical benefits, and that is something few business journalists have the patience or knowledge base to write about. If you want to read about this integration go to this article in Drug Channels, an on-line newsletter published by Adam Fein. This will give you some details of how pharmacy benefit management (PBM) consolidation forces drug manufacturers to lower their prices and helps drive cost savings on prescription drugs. As far as medical benefits integration you need only compare the resulting merger to UnitedHealth Group. 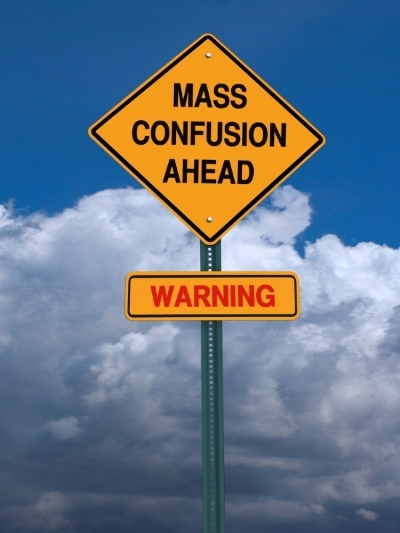 This company has an insurance arm – UnitedHealthcare – that looks a lot like Aetna, and a healthcare services arm – Optum – that has a PBM that looks a lot like CVS’ Caremark subsidiary. Optum also has a clinic/provider network that is significantly larger than what CVS has right now. If we were to predict what happens from here it would be that CVS Health begins to expand its clinic and provider network well beyond the retail clinic space, i.e. urgent care, primary care and specialty care expansion. The next big wave in healthcare will be the move to at-risk payment models sold directly to employers and government. Both CVS Health, Aetna, Optum and UnitedHealthcare are extremely adept at selling to those channels. As their provider networks expand, this will be a major threat to hospital systems across the country. These companies will nip away at the profitable ambulatory care services while leaving hospitals with their not-so-profitable in-patient services. Notice Optum is not acquiring hospitals! Tom Beauregard, UnitedHealth Group EVP and chief innovation officer, will also be speaking our symposium. We look forward to what he has to say about the CVS-Aetna merger. We will discuss in more depth what we expect to see in our 2018 Forecast Issue next month. But suffice it to say that when we write the 2018 Year in Review at this time next year, there will be much greater clarity on a number of fronts: health insurance, telehealth, PBMs, hospital consolidation and fee-for-service medicine, all of which will have indirect influences on the on-demand healthcare space. Older PostShould a Hospital-Run Urgent Care be Profitable?